The special paper cone of Exotic F8 is embedded with papyrus fibers in order to optimize stiffness and damping. An optimally matched whizzer cone of fullrange driver extends high frequency response beyond 10kHz. The magnet system of SEAS Exotic F8 uses an Alnico V ring magnet for high sensitivity, excellent stability, and low distortion. 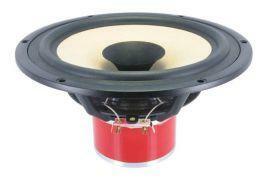 A copper cap on the pole piece, combined with an under hung voice coil reduces nonlinear distortion to a minimum.